I have a beautiful 104" by 88" quilt I am interested in selling. I also have the antique bed dated back to 1880's that this quilt was made for. I know it is very old but it is in excellent condition for its age. 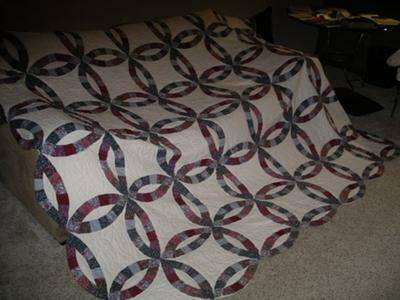 The Arch quilt has rings around the whole quilt just giving it a beautiful design. I am just wondering how much this quilt is worth so that I may get what its worth. This antique Double Wedding Ring quilt is certainly a treasure to have! 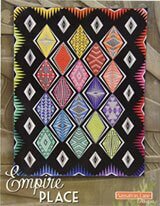 The current market: What similar quilts are selling for now. Condition: Fading fabrics, holes or tears from use or fabric weakness and staining all reduce the value of a quilt. 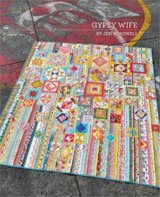 Construction techniques: Quilts by skilled quilters and well-made quilts are, generally, worth more. Quilt design: Is it pleasing to the eye? Good color and design choices. 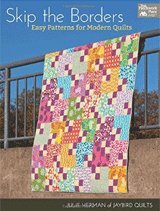 Does the quilting add or detract from the quilt, itself. Hand or machine quilted. One is not appraised better or worse than the other. Regardless of the method used, the quilt will be evaluated on how much quilting there is, how complex it is and how well it was done. History of the quilt: The quiltmaker, where, when and why it was made may all affect the value placed on your quilt. You probably noticed that no where in this list is sentimental value. If you choose to donate this quilt to a museum, you will need to have a written appraisal from a qualified appraiser if the value is over $500.00. Such an appraisal will determine what the tax deduction for your donation will be. Since I am not an accountant, you should verify the requirements with your accountant. If you ship the quilt to a buyer, DO NOT put the word 'quilt' on the package. Use a more general description like 'fabric' or 'blankets'. Moreover, should the quilt be lost or ruined during transport, a certified appraisal helps prove/support the quilt's value that you entered on any shipping forms. An insurance company faced with a payout will want such proof. 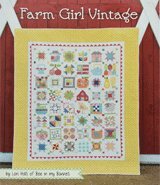 Check your local and regional quilt show advertisements. 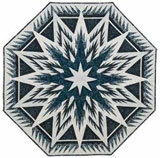 Frequently, a certified quilt appraiser will be conducting appraisals during the course of the show. Good luck to you. May you find the perfect new home for your treasures!